Anatoly Krasovsky was born on May 17, 1952 in the town of Krupki of Minsk Oblast. He studied physics at Belarusian State University. Professor, candidate of Philosophy, author of dozens of scientific works and a number of student books, creator of the school course "Ethics and Psychology of Family Life". In the early 90s he turned into an important entrepreneur and publisher of popular magazines Ya&Ya, Ideal and others. He was involved in charity work, rendered financial assistance to a number of Belarusian social organizations, including ones politically non-engaged. 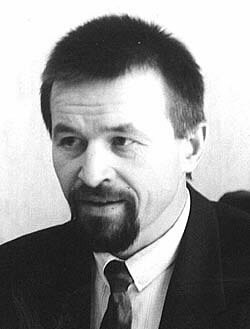 He was known as a personal friend of deputy chairman of the Supreme Soviet of the 13th Convocation Viktor Gonchar, Belarusian opposition leader of the late 90s. The arrest of Anatoly Krasovsky in August 1999 became a first signal of extreme discontent of the authorities by his political activities. The entrepreneur was placed into a detention center where he de facto faced charges of subversive activities. However, after some details of the incident leaked into a number of mass media the Investigations came up with another version according to which Mr. Krasovsky failed to pay up on time a credit given by the Poisk Bank. It did not take a long time before this charge fell to pieces because of its evident inconsistency. In a week's time the entrepreneur was released together with other detainees on this case, including the Poisk Bank President Ms. Valentina Surina. However in order to get released Mr. Krasovsky had to pay a bail of $102,000. Photographs of Anatoly Krasovsky selected by his family members.